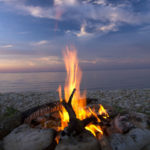 From the Stone Age to modern times, people have gathered around outdoor fires for the feeling of security and excitement that comes from sharing the fires, with their deep glow and dancing flames, together. Now you can have the camaraderie and romance of an outdoor fireplace in your own backyard. 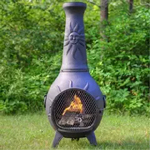 There’s a wide variety of outdoor gas fireplaces, outdoor wood fireplaces, chimenea, fire bowls, and fire pits on the market. 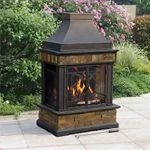 The tips and suggestions below are intended to help you select an outdoor fireplace, fire bowl, or fire pit that meets your needs and use it safely and effectively. What Do You Want from Your Backyard Fire? want to be able to cook over your fire. 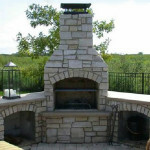 How Do You Choose the Correct Height Outdoor Fireplace or Fire Pit? Think about what you want from your backyard fire and visualize yourself enjoying it. If your goal is mainly socializing around the fire, you’ll want the fire low enough to see your friends over. 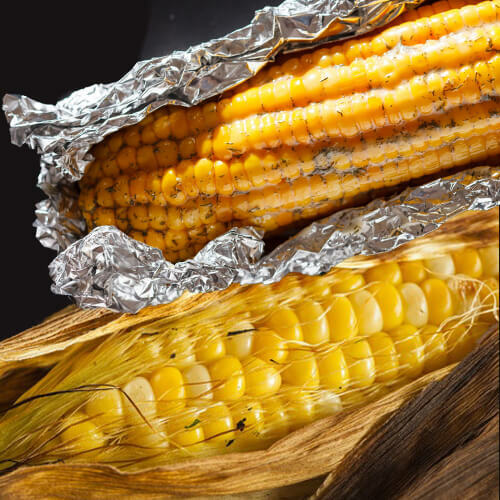 Is cooking in your backyard your primary goal? If so, think about a height that will be comfortable to use. 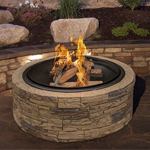 If you want a fire pit, it can be below ground level so that just the flames show, or elevated to any height you want, up to a couple of feet. 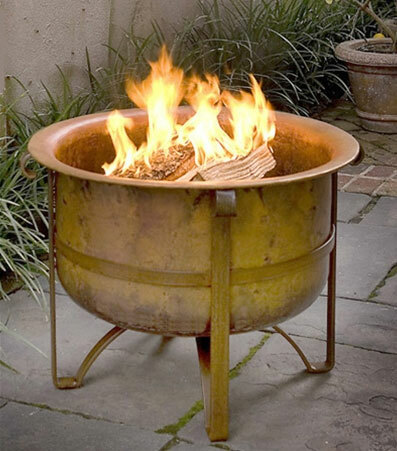 Take Prevailing Wind Direction into Account When Positioning Fire Pits, Fire Bowls, or Outdoor Fireplaces. Most locations have seasonal changes in prevailing wind direction. Find out which way the wind blows in the different seasons. In Virginia, for example, the winds come mainly from the southwest in warm weather and from the northwest in cold weather. Of course there will be days when the wind blows from different directions, but the prevailing wind direction will apply more days than not. Try to get the prevailing wind to your back, so that smoke will blow away from you. Try not to put your outdoor fireplace, fire bowl, or fire pit in an angle of your home’s exterior because swirling eddy currents are likely there. What if Local Ordinances Do Not Allow Fire Pits? See if an outdoor fireplace, fire bowl, or fire pit with a grill is allowed. Many localities allow outdoor fire appliances only if they incorporate a grill. 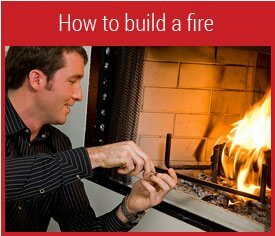 makes it easier to start and maintain a fire. 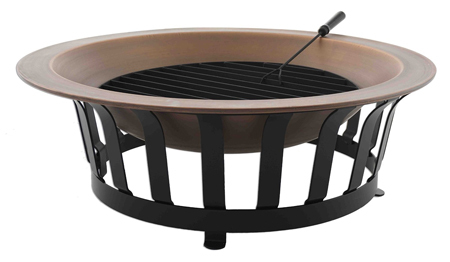 Off-the-shelf sizes for round fire pit grates and rectangular grates are readily available. Start with a Small Outdoor Fire. Get to know your backyard fireplace. The first time you use it, use just a little bit of fuel for a trial run. You can see how your outdoor fireplace or similar appliance drafts and how it changes when the wind direction changes. If the draft is poor, that is if the fire doesn’t burn briskly, try raising the grate. Whether selecting and locating outdoor fireplaces, fire bowls, or fire pits, keep safety in mind. 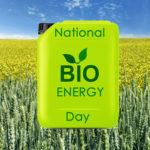 Your appliance may burn wood, LP or natural gas, or gel fuel. It will get very hot . Choose a location where you can easily keep an eye on it. Never leave it unattended because children can forget that it’s dangerous and touch it or run into it. Even adults lose their focus occasionally and come into contact with hot surfaces. The wind can change directions and intensity very quickly, blowing hot coals out of the appliance. Keep some means of extinguishing the fire handy—a hose, a fire extinguisher, or a bucket of sand. Make sure the fire is completely extinguished when you are through with it. Put ashes in an ash bucket with a lid, so that no lingering sparks can cause a fire. Fireproof gloves, the insulated, leather type you use with you indoor fireplace can prevent a nasty burn. 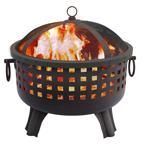 Most outdoor fireplaces and fire pits come with a mesh spark screen. 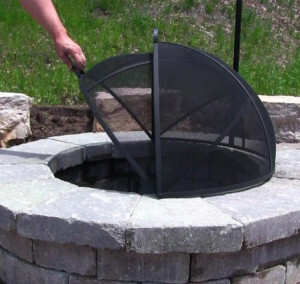 If your fire pit doesn’t have one, or if you need a replacement fire pit screen, we recommend the Easy Access Fire Pit Screen. After the initial flames diminish to hot coals, put the screen on, especially if you live in a dry area where wildfires are known to happen. Choose a safe place to store fuel. How to Manage Smoke with Outdoor Fires. All wood-burning appliances produce smoke. You can minimize the amount of smoke by choosing well-seasoned hardwoods, like oak and hickory. Green un-seasoned wood, even If it’s hardwood, and softwoods like pine, will give off more smoke than hardwood that has seasoned several months since it was cut and split. If smoke is bothering your guests, you can rearrange seating to be upwind. Some outdoor fireplaces, like chimineas, have chimneys that direct smoke upwards. These are great if someone among your family and friends is sensitive to smoke. 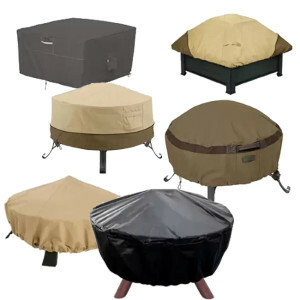 Use a Cover on an Outdoor Fire Pit or Fire Bowl. 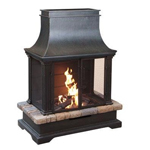 Many outdoor fireplaces and fire pits come with a cover to protect the appliance from rain, when not in use. 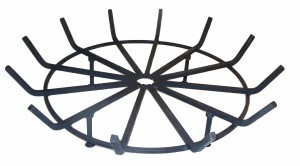 Aftermarket fire pit covers are also available. 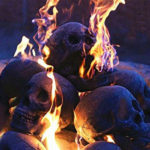 Rain mixed with ashes is quite acidic and will shorten the life of fire pits or outdoor fireplaces. Iron and all steels except stainless steel will eventually rust over time, especially in areas where acid rain is prevalent.